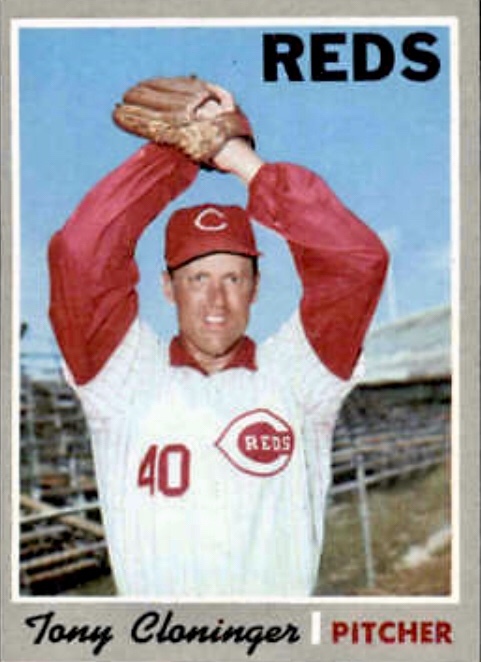 Tony Cloninger, who pitched in the National League from 1961-1972, died a couple of weeks ago. I started following baseball when the Braves moved to Atlanta in 1966, and one of my favorite baseball memories is the game on July 3 of that year when Cloninger hit two grand slams against the San Francisco Giants at Candlestick Park. 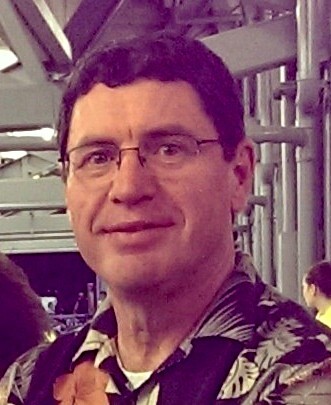 Cloninger, nicknamed Top Cat because of his initials, came into that game on July 3 as a hot hitter; he was six for his last 16 with two home runs and nine runs batted in. The Braves knocked out Giants’ starting pitcher, Joe Gibbon, after only 2/3 of an inning. With two men on, Bob Priddy replaced Gibbon and promptly made things worse by walking Denis Menke. That brought Cloninger to the plate, and he hit the first of his grand slams. After grounding out in his second at-bat, Cloninger hit his second grand slam in the top of the fourth against Ray Sadecki, the Giants’ third pitcher of the evening. Cloninger flied out to left field in the sixth inning before topping off his magnificent night at the plate by driving in another run with a single in the eighth inning. On the mound Cloninger labored through the 1966 season, finishing 14-11 with a 4.12 earned run average, including a 13-inning complete-game loss on Opening Day. As a hitter, he hit five home runs, drove in 23 runs, and had a .234 batting average. Such a season likely would get a starting pitcher a long-term deal for millions of dollars these days. Cloninger first came to the big leagues in 1961 and went 7-2 for the Milwaukee Braves. He steadily improved and won 19 games in 1964. 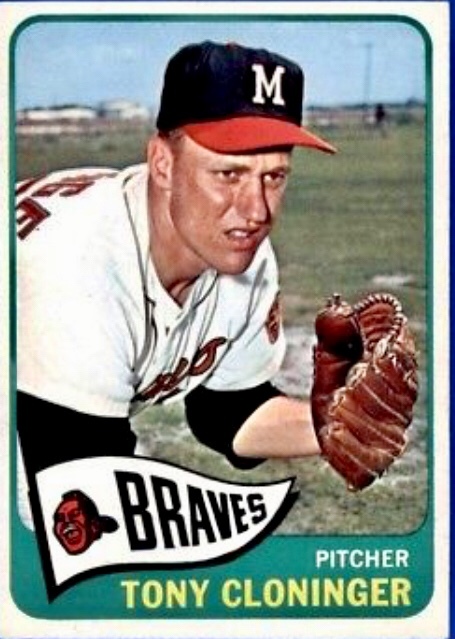 On the strength of a 24-win season in 1965, Cloninger was the starting pitcher on Opening Day in 1966, the first game in Atlanta Braves’ history. 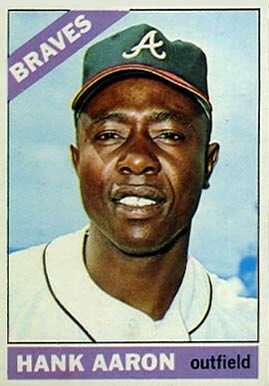 Those 24 games he won in 1965 were the most in a single season in the history of the Milwaukee Braves. Only John Smoltz, in 1996, has matched that total for the Braves since. Injuries limited Cloninger to only 16 starts in 1967, and his record fell to 5-7 with a 5.17 E.R.A. After eight appearances in 1968 – all but one in relief – Cloninger was 1-3 with a 4.26 E.R.A., and the Braves traded him to the Cincinnati Reds along with reliever Clay Carroll and infielder Woody Woodward for pitchers Milt Pappas and Ted Davidson and infielder Bob Johnson. From 1968-1971, Cloninger appeared in 110 games for the Reds, made 77 starts, and had a record of 27-33 with a save and a 4.31 E.R.A. He made one start in the 1970 National League Championship Series and made a start and one relief appearance in the 1970 World Series. Cloninger hit one home run in 1968, two in 1969, and two more in 1970. Just before the 1972 season, the Reds traded Cloninger to the St. Louis Cardinals for infielder Julian Javier. Cloninger made 17 relief appearances for the Cards and was 0-2 with a 5.19 E.R.A. when they released him; Cloninger’s baseball career was over at age 31. Tony Cloninger finished his career with a 113-97 record as a pitcher and 11 home runs, 67 runs batted in, and a .192 batting average at the plate. And because of one big night at the plate in July of 1966, many fans will remember him for his heroics as a hitter. He was 77 years old.